Floyd Mayweather will face Andre Berto on 12 September as he attempts to match Rocky Marciano's record of 49 successive victories. Former welterweight champion Berto has 30 wins and three losses before his bout with his fellow American. "Promise you this - I'm gonna be as ready as I've ever been. Don't act surprised on 9/12," tweeted Berto, 31. 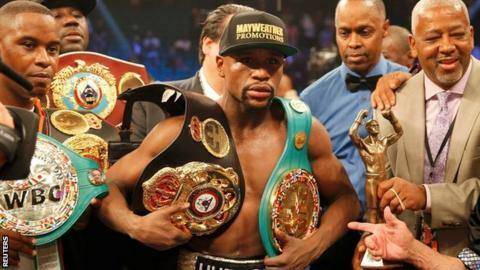 Britain's Amir Khan had hoped for a September bout with Mayweather, 38, after beating Chris Algieri in June. "Mayweather is almost immune to criticism, but he will need all his defensive guile to parry the brickbats heading his way. "In opting to face Andre Berto he has taken some of the lustre off what he says will be his last appearance in the ring. "Berto is a former world champion but now belongs at the bottom end of the world's top 20. "Mayweather has spurned more dangerous opposition such as Amir Khan. It is all in a bid to finish with an unblemished record of 49 fights, but even his own father has been critical." Khan thought he was "closer than ever" to securing a meeting with the sport's pound-for-pound king after his success over American fighter Algieri and Mayweather's own points defeat of Manny Pacquiao in their lucrative meeting in May. However Mayweather has instead opted for an opponent who has lost three of his last six fights, with Berto suffering reverses to Victor Ortiz and Robert Guerro - both of whom have also been beaten by Mayweather - as well as Jesus Soto. "I always bring my A-game and this fight against Andre Berto is no exception," said Mayweather. "He's a young, strong fighter who is hungry to take down the best - 48 have tried before and on 12 September, I'm going to make it 49." If he wins, Mayweather's record will equal that of legendary 1950s American heavyweight Marciano, who retired from the sport without suffering a professional defeat. Mayweather's meeting with Berto will be the final bout in a six-fight deal he agreed with American broadcaster Showtime in February 2013. Mayweather previously claimed his 49th fight would be the last before he retires while his father and trainer Floyd Mayweather Sr claimed in July that his son wanted a "couple of easy fights" with which to finish his career.